At Synergy Water Solutions, we are an integrity driven company who is recognized as a regional leader in boiler water treatment. We are proud to provide exceptional results to our clients and our team strives for excellence every step of the way. 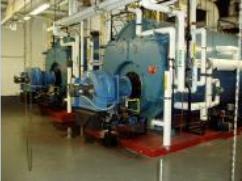 All of our boiler water treatment programs are developed to meet specific requirements of each facility that we service. Treatment programs are custom tailored around each facility’s water quality in order to protect boiler systems from mineral scale formation and corrosion. Synergy boiler programs help prevent scale and corrosion which can result in slowdowns, shutdowns and inefficiencies, as well as preventing foaming and priming which can cause water carryover into the steam system. The heart of steam production is the boiler. Its operation can affect the overall efficiency of any process operation. The ultimate end results are minimal utility cost, maximum boiler efficiency and extended equipment life. Our preboiler, boiler internal, and condensate treatment programs include a full line of quality products, including oxygen scavengers to protect against oxygen corrosion, advanced polymer blends to control hardness and metal oxide deposits, and corrosion inhibitors for minimizing corrosion in condensate circuits. Synergy Water Solutions is the northeast region’s preeminent supplier of engineered chemical treatment programs for water and process systems operating in a wide variety of industrial and commercial applications. The Association of Water Technologies (AWT) is the international water treatment association representing over 500 companies that specialize in applying water treatments for industrial and commercial cooling and heating systems. Copyright ©2016 - Synergy Water Solutions, Inc.